Maximize your exposure by reaching thousands of prospective buyers every month . Beautifully presented, all names are curated by Squadhelp branding experts. Also submit your names to hundreds of naming contests every month. With a combination of significant marketing investment, branding experience (from our 20,000+ naming projects) and smart technology, our platform delivers higher sales in a relatively short time-frame. While our goal is to deliver the most value to the sellers, we don't inflate selling prices to unrealistic levels. Since we do not charge any listing fees or appraisal fees, the only way we make money is if the name sells. We price the domains at a realistic level, in order to maximize the selling potential for your names. In addition to eye catching Logo Designs, many of the names also receive beautiful, lifestyle images that boost the presentation and selling potential of the name. Pitch directly to end users. Squadhelp hosts hundreds of naming contests every month. Several of these companies have budgets ranging from $2000 to $100,000 to find a perfect name. Submit your names directly to these contests and increase your liklihood of a purchase. All names in our Premium Domain Marketplace receive eye catching logo design from our professional creative designers. Many domains also receive a lifestyle image that greatly enhances the presentation. There are no listing fees, no withdrawal fees, no appraisal fees. You only pay the commission that is assigned to the name. 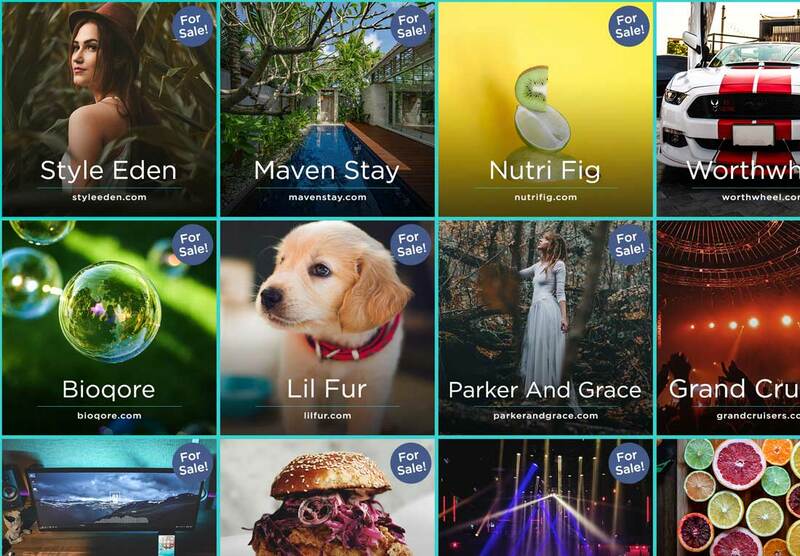 Our advanced AI and Visual Search technology personalizes the user experience for our buyers and they receive the most relevant name recommendations based upon their interest and preferences. This increases the liklihood of buyers finding a great name. Our smart AI based technology automatically recommends your names to the most relevant naming contests. Our typical response time for incoming buyer inquiries and support requests is under 5 minutes. Our team is online 24 X 7 across all time zones including holidays. Do I need to pay any listing fees? Unlike other Marketplaces, Squadhelp does not charge any fees besides the standard selling commission. There are no listing fees, no Logo Design fees, no Appraisal fees or any other hidden fees. Do you also register names on behalf of sellers? Squadhelp is the only platform that also pays for Domain registration as an alternative listing option. Simply go to your Marketplace Dashboard to start submitting great domain name ideas, and if your name is accepted, SH will register it on your behalf. In this case, the commission you receive is lower than the commission offered on seller registered domains. While we do not disclose the actual marketing spends, our marketing investment is by far the highest in the industry. As a result of our significant marketing spends, we attract the highest amount of visitors (more than 200,000 unique visitors every month). See the SimilarWeb ranking report in previous section for a detailed comparison. Do you have any special incentives for large domain portfolios? We offer an installment plans to our domain buyers. This plan is fully managed by Squadhelp and you have complete control on whether or not to participate in this program. Are there any fees for withdrawal? There are no fees to withdraw your commissions from SH to your Paypal or Payoneer account. Simply sign up as a Creative and visit your Marketplace Dashboard. Follow these instructions to begin submitting your names. Ready to get started? Create a free account and start submitting names.